Another red letter day for Pate Boatyard as we finally got the sloop "Just U" overboard. This boat was abandoned several years ago and it took another couple of months just to get the trailer rolling properly. 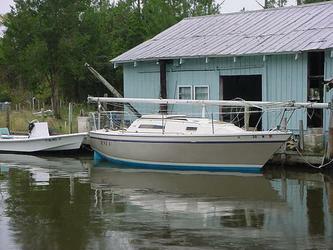 She slipped overboard pretty easily and then Cap'n Jack towed it around to the boatyard.